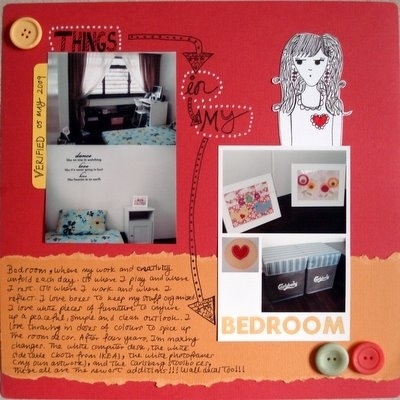 After the “Things In My Bag” scrapbook idea we did back in late January, I thought why not do a layout about things in your bedroom? Are you a total neat freak and have to have everything organized and super tidy? Then you’ll have a very neat bedroom to capture a few photos of. Even if your bedroom is in a big mess and jam-packed with your collection of stuff, don’t shun away from this idea. Why not reflect the true state of your bedroom in a layout? It shows a bedroom with character. Ok, my bedroom remained about the same, except for minor changes here and there over the last four years. This month, I’m updating my bedroom. I have several new additions to my bedroom and guess what, I forgot to take a picture of my bedroom in its “before” state. So these photos are the updated ones of my bedroom. At least I’ve done it and when I am to move away from this place in the future, I could look to this layout to see my “old bedroom” in its living, breathing state. Supplies used: Cardstocks – Bazzill Basics and The Paper Company; Black pen – UniBall Signo UMN207, Zig Memory System “Millennium”, Uni Pin Fine Line; White pen – UniBall Signo Broad; Buttons – Autumn Leaves “Foof-a-la”; Red pen – Zig Memory System “Fine & Chisel”; Paperdoll – inspired by Elsie Flannigan; Corner rounder; Sketch: 500 Scrapbooking Sketches No.149.